I wanted to take some time and do my first Photoshop tutorial for this blog. I’m very excited to share with you the technique I use for creating post production lens flare like you see featured in the above photo. I will not be teaching you how to make the wings in this tutorial, I will some time in the near future. I will also not be showing you how to do my “trademark” color enhancements. The only way to learn my color enhancement technique is to take my “One on One” photography workshop. Quick tangent. The One on One workshops have been going great. I’ve met with some very wonderful people and have really loved watching their talent and gifts grow. I’ll be posting my first student’s work soon, after we meet for our final portion of the workshop “Editing”. So first we’ll look at the original photo. This is nearly straight off the camera. I shot this (as I do 99% of all my work) in “.raw”. 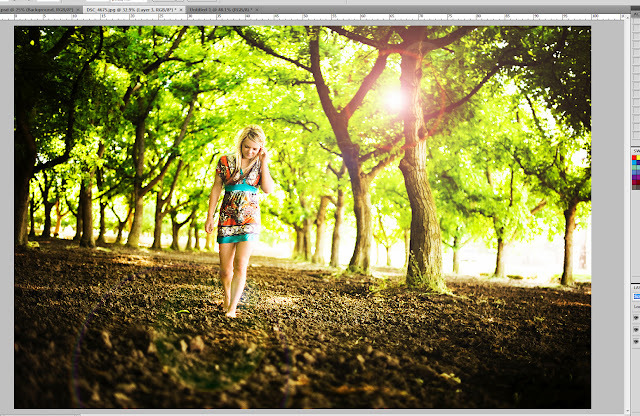 I only boosted the contrast to full capacity in the Photoshop CS4 raw editor. As well as played with the “Temperature” and “Brightness/Exposure” sliders until I was content. I take the photo through my signature editing technique. 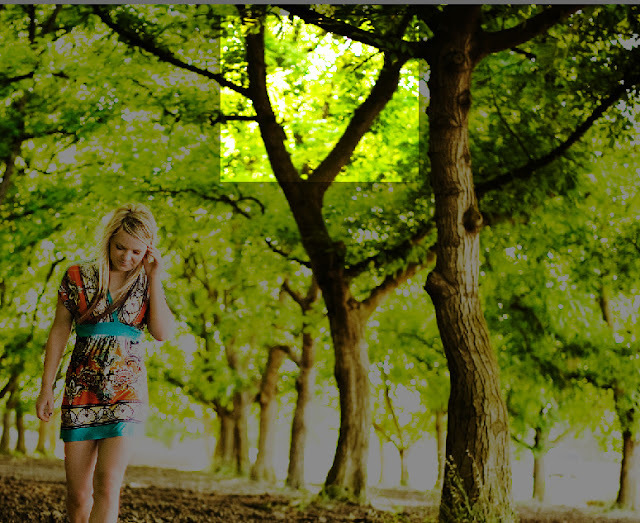 Once again check out the Photography Workshop to learn how to do this. All of the colors have become much more vibrant. While her skin is left looking very natural. Now take your photo through your typical editing technique and you’re ready to begin. We must fist determine where the sun is coming from. This is a critical first step. If we look at where the sun spots are on this photo, as well as where the tree tops seem the most pale, we will be able to recognize where it is coming from. I am inclined to believe it is coming from this area. I know you’re thinking, “why?” Please just trust me. But if you really have to have an explanation I’ll give you one. By adding our lens flare to a seperate and exlusive layer we give ourselves the ability to manipulate it. My favorite way to create a new layer is “ctrl+shift+N” then press a dialog box will appear, name the layer if you like, and press okay. Next select you the fill bucket and paint your new layer solid black. Step Three: Add Lens Flare to the New Layer. 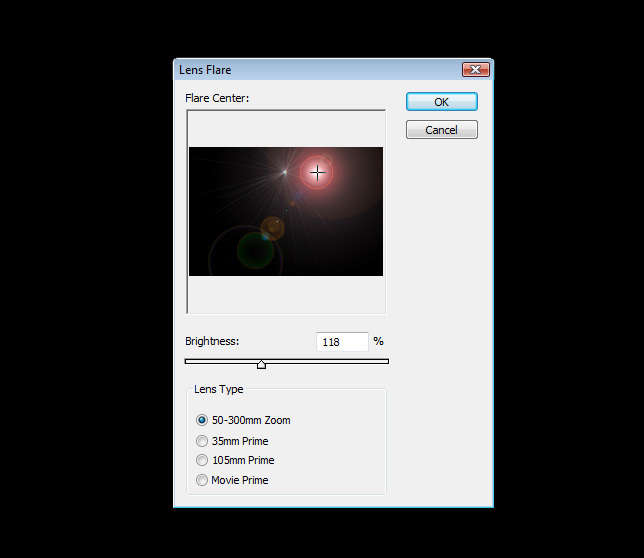 Now we’ll experiment with the different settings to find a flare that is similar to what you are imagining. I personally prefer the “Zoom” style flare because it is the most dynamic. Obviously we have to guess where we are putting the flare because we can’t see our original picture. So just try to get it about where it needs to be. 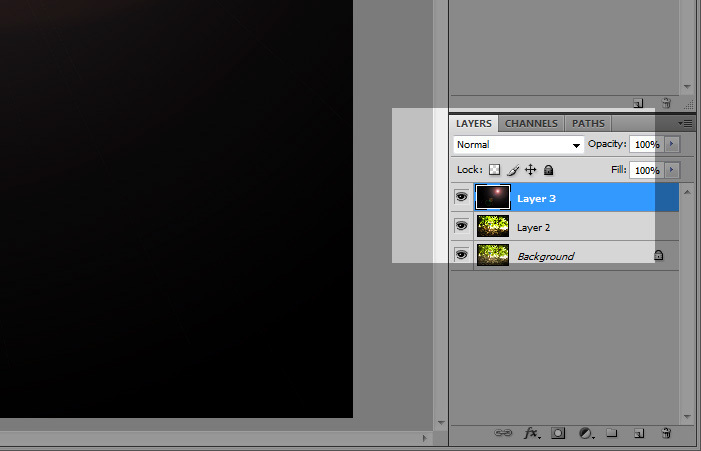 Move your cursor over to the layers pallet. See where it says “Normal” click that, this is our blending mode. We will select “Screen” from the drop down menu. all of the black on our image should disappear and we’ll be left with our lens flare over our original photo. You’ll notice the box appear. Simply grab it on the corner and move it where you desire. Or right click on the box and explore the other options. 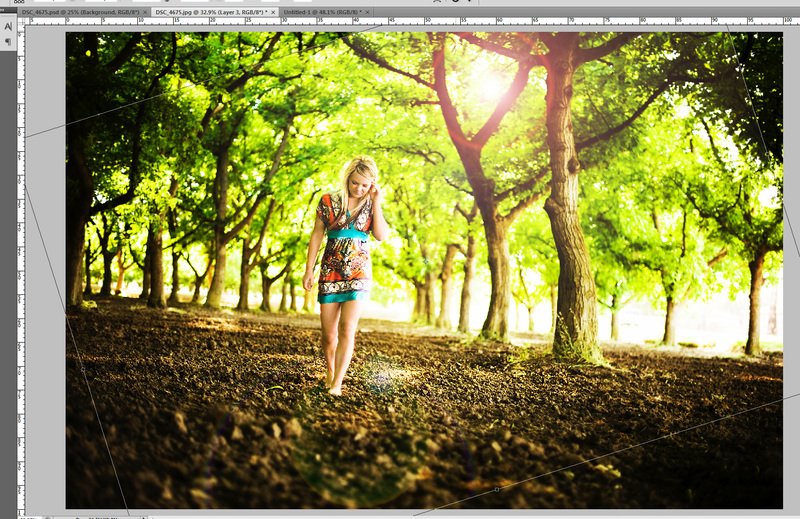 Create as many duplicate layers as needed to achieve the brightness you desire. 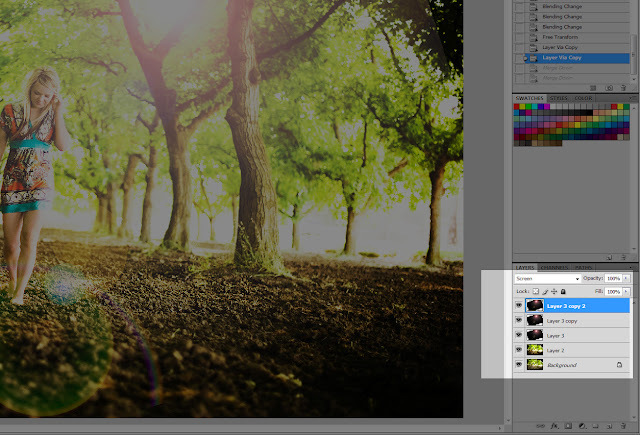 Then press “ctrl+E” and merge all of the lens flare layer together as one to make it easier to manipulate. Experiment with your lens flare, try creating another duplicate layer and change the opacity, or free transform the new duplicate layer. I usually do another duplicate layer, free transform set to “warp” because most lens flare is nowhere near this uniform. And having such a uniform flare makes this very recognizable as a “photoshopped” flare. Your going to add just enough blur to take the super sharp edge off. Most times a real lens flare is very sharp. However in order to preserve what is called “believable Surrealism” we must take off this sharp edge to make the flare less apparent to the eye. Our final product should look something like this. There you have it. One final suggestion, please be modest when doing this. Meaning, don’t add lens flare to every photo you take. Just add it to a few that look like they could benefit from it. Not every photo needs it, nor does every photo have room for it. If you need any clarification please post it below so others can benefit from your question. If you want to ask in email me. 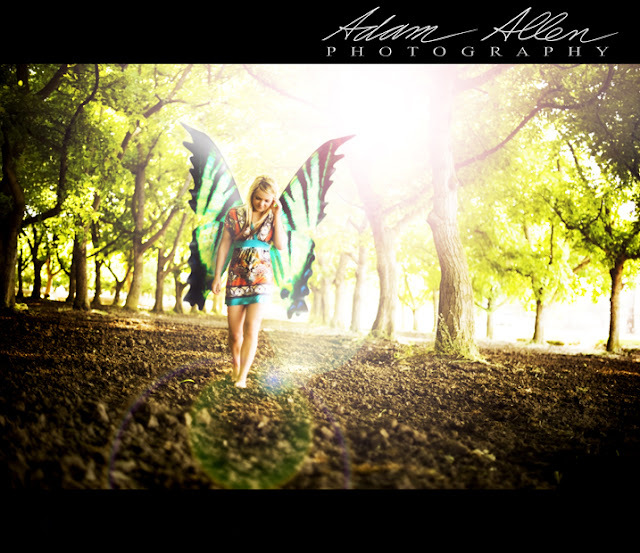 Please email me at adam@adamallenphotography.com. Katherine Vargas - wonderful tutorial very simple and in easy step.thank you for sharing it. Jamie Solorio - Thanks for such a wonderful tutorial! I have been looking for a good one for flare for some time, and this one is my favorite so far! Thanks again!